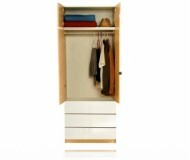 Store all your clothes in one spacious place. 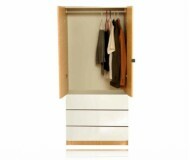 This Basics 547 contemporary wardrobe features 2 large shelves with built-on hang rods behind the double doors. It provides plenty of space to hang your clothes, while using the top and bottom shelves for your shoes and other bedroom accessories. 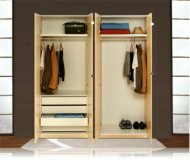 This bedroom closet provides great storage space, for rooms that require additional storage space for of out-of-season clothing or formalwear. With your choice of case finishes, it's easy to match this wardrobe armoire with any decor. Additions units can be place side by side for seamless integration, creating virtually unlimited customize interior configurations. 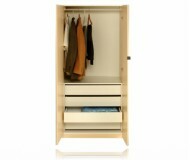 Also Available in both lacquer and mirror fronts.